Steven Feldman, MD, PhD, researches dermatologic treatments—including studies of adherence to treatment—and develops practical approaches and products that improve patient compliance with medical regimens. He works with industry as consultant and advisor on psoriasis and medical adherence and directs clinical trials that improve dermatologic care and medical adherence. 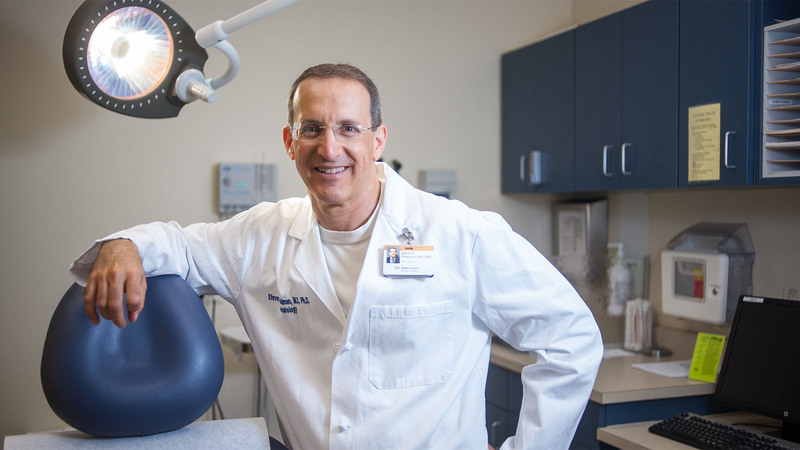 Steven Feldman, MD, PhD, earned his medical degree and doctorate from Duke University in 1985. He completed his dermatology residency at the University of North Carolina at Chapel Hill and his dermatopathology residency at the Medical University of South Carolina. After his fellowships, Feldman joined the dermatology department of Wake Forest School of Medicine in 1991 and became director of the psoriasis treatment center in 1992. Steven Feldman publishes extensively on the treatment of psoriasis, his primary clinical interest, and other dermatological ailments. He is the chief medical editor of The Dermatologist, editor of the Journal of Dermatological Treatment and writes a column for PM360 on medical adherence. In his practice, Feldman discovered a need to promote medical adherence and instituted adherence studies that revolutionized how he and others practice dermatology. He has subsequently published prolifically on medical adherence, including a book, Practical Ways to Improve Patients’ Treatment Outcomes. His current research has expanded to include improving adherence among patients taking hypertension, cholesterol, psychiatric and diabetes medications. Over the past decade, Feldman has developed practical ways to improve patient medication adherence, such as developing products that assist doctors in increasing adherence among their own patients. He created an online doctor rating website, DrScore.com, which provides the detailed patient satisfaction feedback doctors need to enhance care quality and outcomes. Building on over a decade of research and implementation of adherence solutions, Wake Forest Innovations spun off Causa Research to commercialize the practical, powerful adherence solutions that Feldman developed. Feldman believes that doctors need to be in the business of making their patients well, not just giving them the right diagnosis and prescribing the right treatment. He believes that many new tools can be easily implemented to improve patient care and to help doctors achieve more successful treatment outcomes for their patients. In his research, Feldman has demonstrated that working with industry can revolutionize how doctors practice medicine and how patients approach medications. His collaborations with industry have been extremely fruitful, as his adherence work has been primarily industry-funded. In addition to improving patient wellness, increasing medical adherence benefits many areas of industry, including health systems, pharmaceutical companies, insurance companies and others who benefit from patients using their medications. Feldman works closely with industry in his research, consulting with companies as a psoriasis expert, participating in advisory boards, and directing both industry-initiated and investigator-initiated clinical trials. His collaboration with industry includes establishing the Center for Dermatology Research in order to improve dermatologic care. He believes that researching psoriasis, an area of extensive academic and industrial collaboration, benefits researchers, pharmaceutical companies and patients by influencing patients’ lives and revolutionizing medical practice.